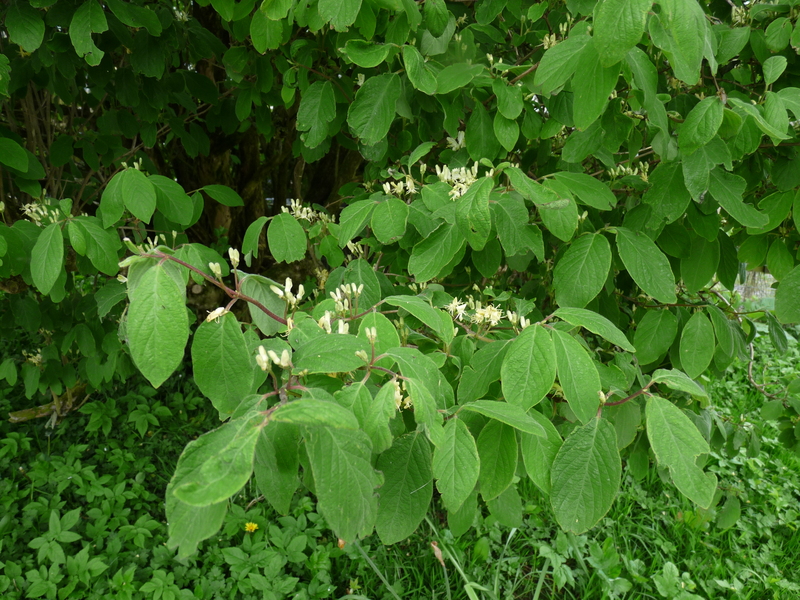 At around 3-4m tall this is a large shrub or small tree. But what is it? 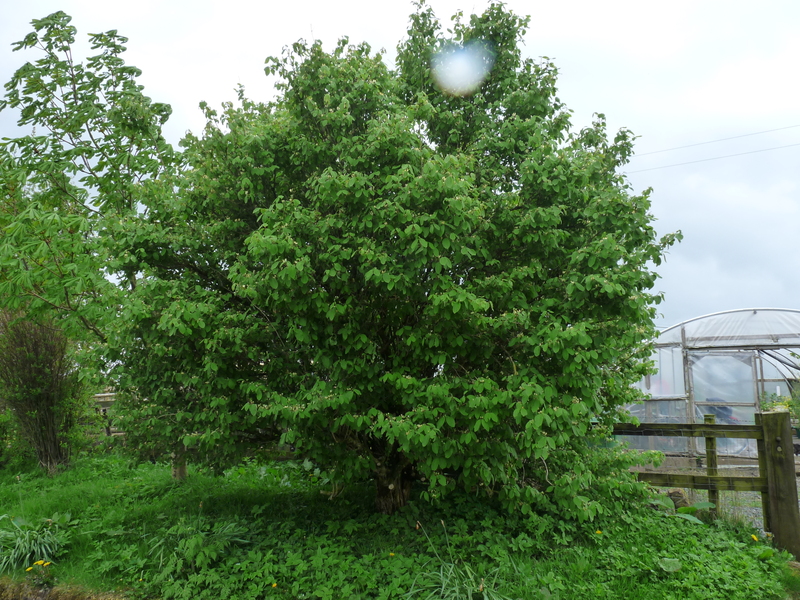 We have a large shrub or small tree in front of the house at Greenholme. We have not been able to identify it since we arrived, and neither has anyone we have asked. Around 4m tall, bushy character, multiple twisted and gnarled trunks, not thorny. Leaves not serrated, not lobed, broadly oval with slight point at end, up to 7cm long, slightly yellowy-green, matt and hairy on both sides, and in opposite pairs. 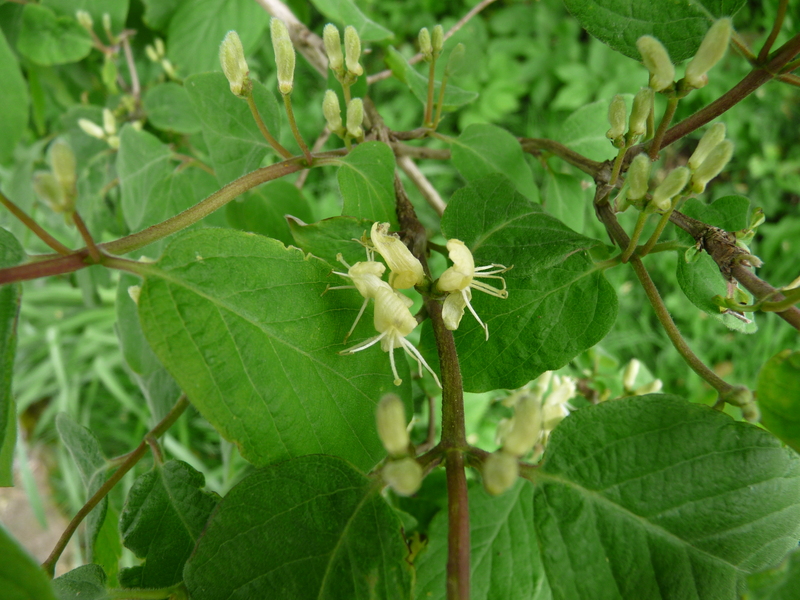 Flowers are small, pale yellow, about 1cm in length, two petals, 5 carpels, 1 stamen. They occur in pairs at the end of a flower stalk about 2 cm long, two flower stalks growing from the base of each leaf-pair. The tree is constantly buzzing with bumble and honey bees. Been in flower since mid April. A comprehensive search through the Collins Tree Guide revealed nothing that matched. Inflorescence consists of a pair of small, pale yellow flowers on each stalk, each with two petals, five stamens and one carpel. An online search through various tree and shrub dichotomous keys resulted in a couple of false positives, the closest of which was a viburnum, but the inflorescence was wrong. The Natural History Museum (NHM) provides a vast wealth of online research as well as resources to assist in identification of British wildlife, including several keys, which at present cover trees, bumblebees, woodlice, lichens, earthworms and bluebells. So there we have it! And what a wonderful resource the NHM provides. The UK plant atlas referenced in the response is another excellent resource. The NHM also provide a useful wallet-guide for the six most common bumblebees – a really handy little card. Following the popularity of our first Open Day last year, we have decided to offer another opportunity for folk to visit. This year it will be on Saturday, 19th July from 12-5pm. As last year, James Newcome, Bishop of Carlisle, should be with us all afternoon. The involvement of our local community is an extremely important component of what we are attempting to do. So hopefully there will be lots of craft activities to see and try, including basket-weaving, peg-loom weaving, spinning, blacksmithying, organic cheese, stained-glass crafting, hand-thrown pottery. There will also be music to listen to or play (so bring an instrument along), face-painting, free food and beer, and a short, informal open-air service (weather permitting) for those who wish to participate. This is an opportunity to explore the site and discuss the exploration and development of permaculture-based practices on our 6-acre smallholding, including experiments in no-dig grain and potato growing, aquaculture, willow forage and biomass, reed beds, forest garden etc. There are also pigs to romp with, chickens to feed, a horse, guinea pigs and a dog! Plus talks on the Met Office weather station and bees a year on. Entry is free (it is, after all, an open day!) and all are VERY welcome! ‘Zoomable’ map to find us is here. We never seem to hear politicians or mainstream economists challenging the mantra of economic growth, even though it is clear the planet is already suffering its devastating consequences. In June 2010 the first Steady State Economy conference was hosted at Leeds University. A brief personal summary can be read here. The organisers of the conference have recently published a book deriving from it titled Enough Is Enough, and this video giving an overview and summarising three aspects: debt, inequality, and unemployment. It is a message we need to hear and act upon. The quotations are taken from Touch The Earth: A Self-Portrait of Indian Existence. It is tempting to think there is a degree of Romanticism in such views, but it is difficult to see how Native Americans would have come under that movement’s influence. It is much more likely they are genuine reflections of this ancient, aboriginal culture. However, it is not difficult to reconcile these attitudes with the creation stories of Genesis 1 and 2, or Moses having to take off his sandals because he was standing on holy ground in Exodus 3. Nor with the realisation that Christ is the second Adam, the ‘gardener’ discovered by Mary Magdalene in Jesus’ first resurrection appearance in John’s Gospel. In particular, the thorny issue of the meaning of ‘dominion over creation’ in Genesis 2, that has taxed Christians over the centuries, when understood with reference to the nature of ‘lordship’ exercised by Christ, himself, that of sacrifice and service, is startlingly illuminated in them. It seems we have something profound to learn from them. The idea, therefore, seemed a good one – to grow grain gently, without digging or using machinery to prepare the ground for planting, by suppressing grass growth through mulching. Our approach was an adaptation of a method pioneered and used very successfully by the late Japanese farmer, Masanobu Fukuoka, which he describes in his book One Straw Revolution. It is an inspiring read. Like the Native Americans, but on the other side of the globe, Fukuoka (who died in 2008) lived by the premise that we can learn all we need to know from carefully listening to creation. If we are attentive, we will see the natural forces of life and some of the myriad interactions that are a living ecosystem. Then, with trepidation, we can begin to join the dance, encouraging this, redirecting that. It took him many years, but he became an inspiration for several generations of people who wanted to relearn how to grow food naturally. Fukuoka, however, was not starting with a field full of Cumbrian ‘reshes’ and creeping buttercup! His field was already cultivated – he merely changed his method of continuing the cultivation from one year to the next. 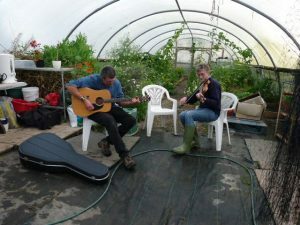 In April 2009, in a field loaned to us by a local church-member and farmer, we attempted an experiment, consciously trying to learn from his approach. We laid three strips of woodchip on pasture, each about 6m x 2m x 5cm thick. This was to suppress the grass underneath, without digging it over, provide a water retentive matrix on which to grow, and yet allow the roots of seedlings to reach down to find the soil. 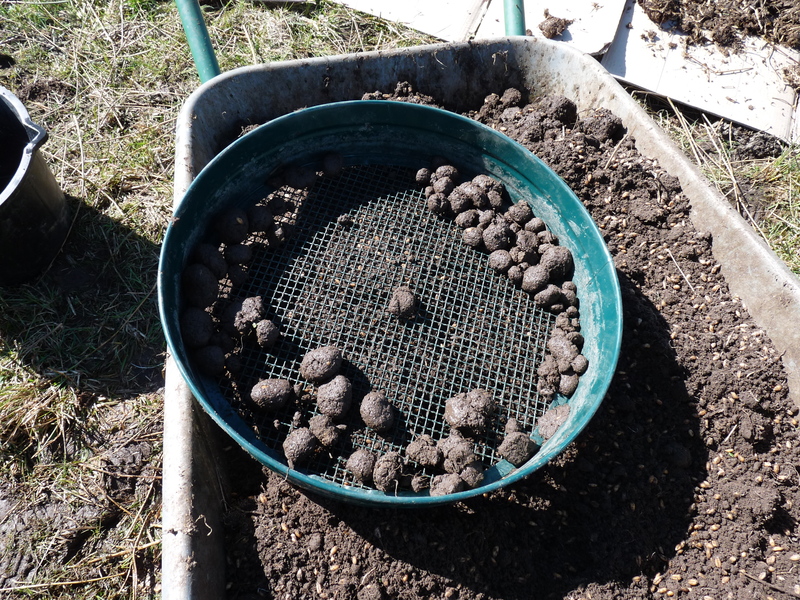 Scattered on top of these we spread seed mixed with moistened compost and bonemeal. One strip had wheat, one oats, one barley, with fuego beans mixed in to all three, as nitrogen fixing legumes. 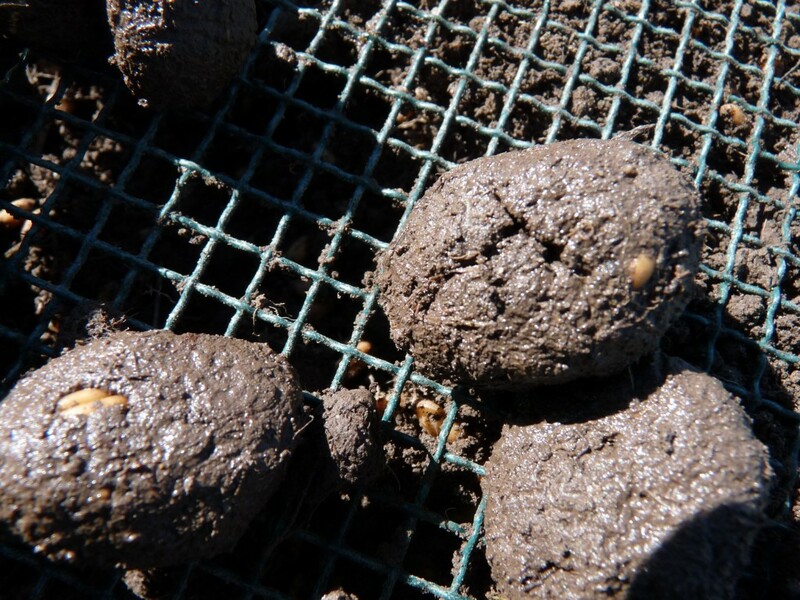 Fukuoka developed the seed-ball method to stop birds eating the seeds, since he wasn’t ploughing them in or covering them in any way, and to provide a growing medium for them when they germinated. Our attempt at making them into mud or clay balls didn’t work, and the broadcast turned out fairly lumpy. Each week we inspected our beds to see if the seeds had germinated. Would the experiment work? Was that blade an oat seedling poking through, or something else? This combination meant we were going to struggle with anything resembling a harvest. In the early stages it looked a complete disaster. Oats, wheat and barley are all forms of grass, so it was impossible for us to tell whether any of our seeds were growing. Nevertheless, the plants grew up in among the grass that forged through the mulch and, towards the end of the summer, fruited, at last becoming visible. Barley in among the grass. A lone fuego bean plant also lifts her head. August 2009. Come harvest, however, there was little to do. We gathered a few oats, no wheat, no barley and no beans. The wheat had not taken, the beans turned black, and the barley vanished. (We were only able to be on site 2 or 3 times a week). Was it the sheep that kept breaking in? Disappointing as failure is, that was an experiment. 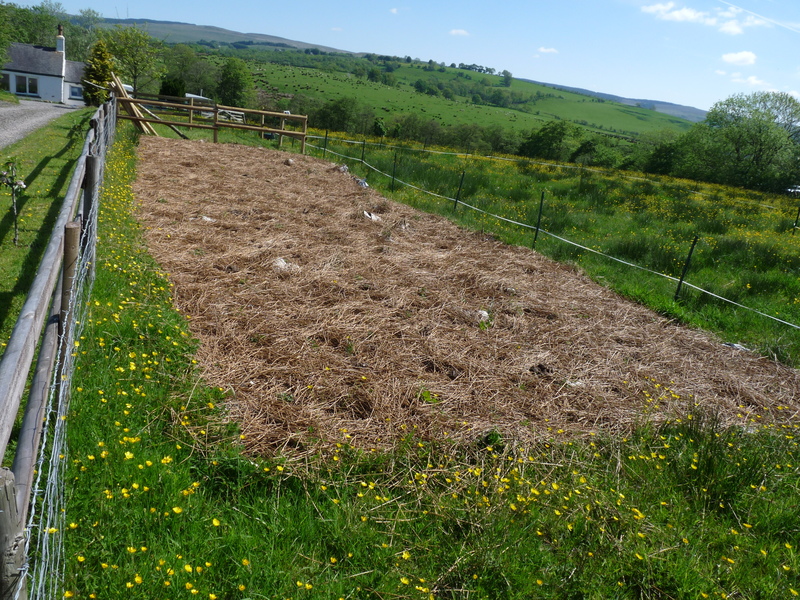 We know mulch needs to be serious enough to suppress grass, that woodchip is not an ideal medium for growing seed, drying out too quickly in the wind, and that sheep can be a real pain! It also helps to be close to your land, which we weren’t. A recent episode of the BBC programme ‘Countryfile’ (26 January, 2014) saw our local MP criticising certain intellectuals for wanting to impose their ‘fantasies’ on the uplands in restoring them to natural woodlands, or ‘re-wilding’ as it has become known. His claim was that the hills had been in their present, treeless condition for 3000 years, and sheep farming is the business of the uplands. Unsurprisingly he made a lot of sense to our farmers. 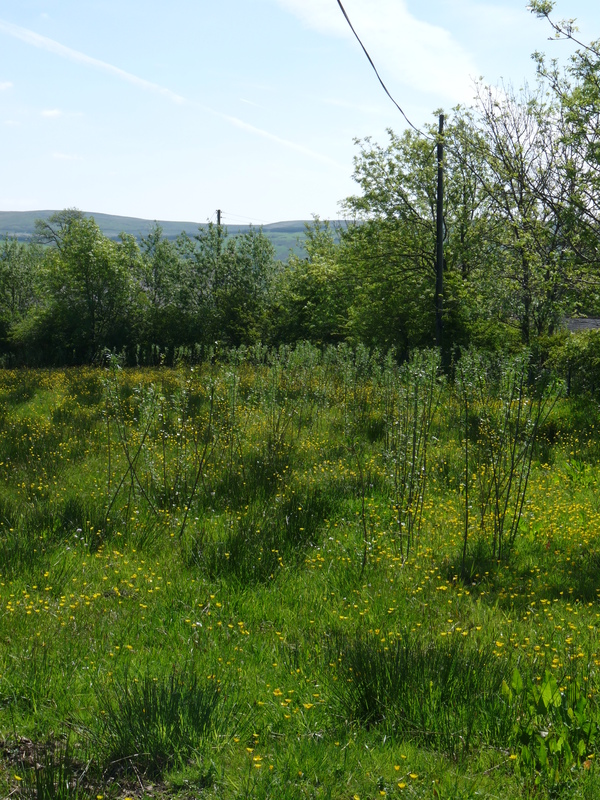 The same programme also showed our local Geltsdale RSPB reserve, and the apparently successful results from trying to combine sheep grazing with wildlife habitat restoration. 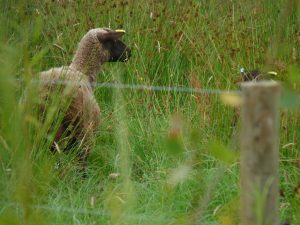 The argument was primarily about sheep grazing, although most upland farms also run cattle for beef as well. But as far as farming communities are concerned, stock rearing is the only method of land management in this area that yields a living. Without it, people can see no hope for the local community. Indeed, there are very few of the upcoming generation showing any interest in following their parents and taking on the family farm. At stake is a real worry about the future. The idea that upland farming yields a living, of course, is itself a fantasy, and only tenable so long as the EU continues to pay generous CAP subsidies to our farmers. As soon as they cease, so would any form of ‘traditional’ upland farming in the UK. One wonders what would happen if the UK were to leave the EU. So we are continuing our exploration of what the land can yield productively, that is not monocultural, that is rich in biodiversity, and that works with the land, rather than against it. Increase biodiversity. Willow hosts the second largest diversity of insects of any native tree in the UK (after oak). This in turn provides a rich and diverse food source, as well as popular shelter, for many different species of passerines. 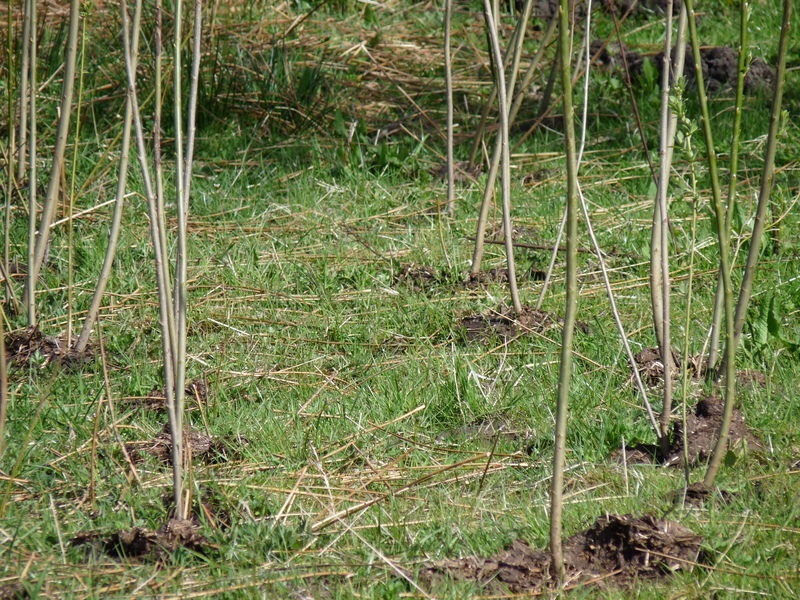 We are using a mixture of willow and poplar to ensure it is not a monoculture. Provide shelter. Quick growing willow and poplar planted along the southern and western borders of our land will soon provide a wind break from the sometimes strong south-westerlies coming in from the Solway. Soak up water and out-compete the soft rushes and creeping buttercup. 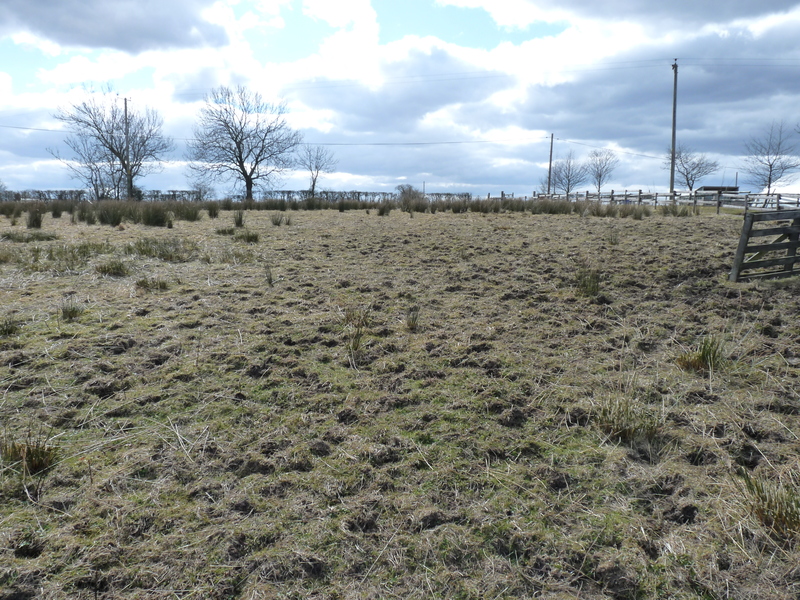 We need a plant that, with the minimum of input from us, will grow well on waterlogged soil, help lower soil water content, and provide an alternative habitat to the juncus effusus that dominates unmanaged grassland. Biomass. 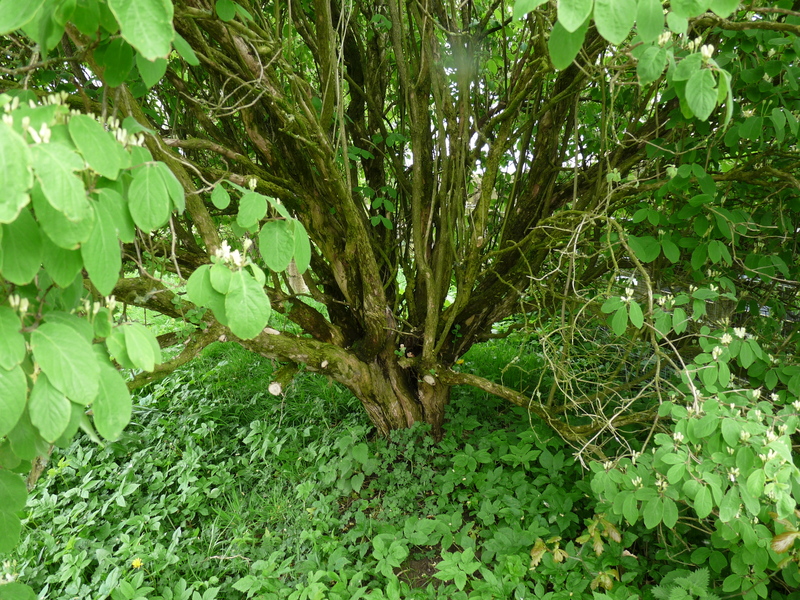 Every 3 to 4 years, through a programme of short-rotation-coppicing (SRC), the willow and poplar will yield a highly productive, valuable, and sustainable, crop of biomass for use in heating. Planting happened late in the season, and there was a risk that many wouldn’t take. 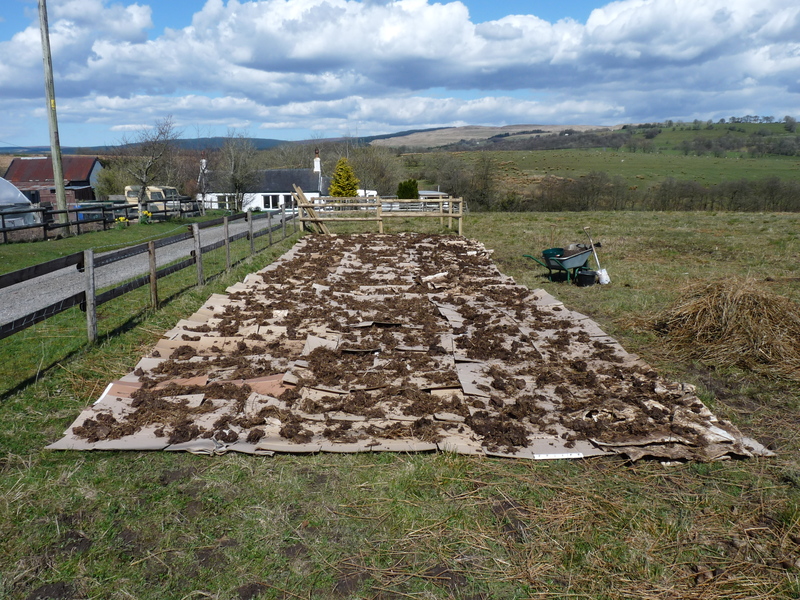 We experimented with a couple of different mulches: cut and dried rushes; rotted manure; nothing. As it turned out, the worry during the summer was a lack of water! But willow, like Christ, is difficult to put down. It is one of those plants that wants to live, and if it sees a chance of life, it will reach out and grab it. Almost all the willow, and much of the poplar, survived. The saplings have taken root and are flourishing, June 2013. The plants that didn’t survive were those trampled by the horse, and even many of them tried to keep going. 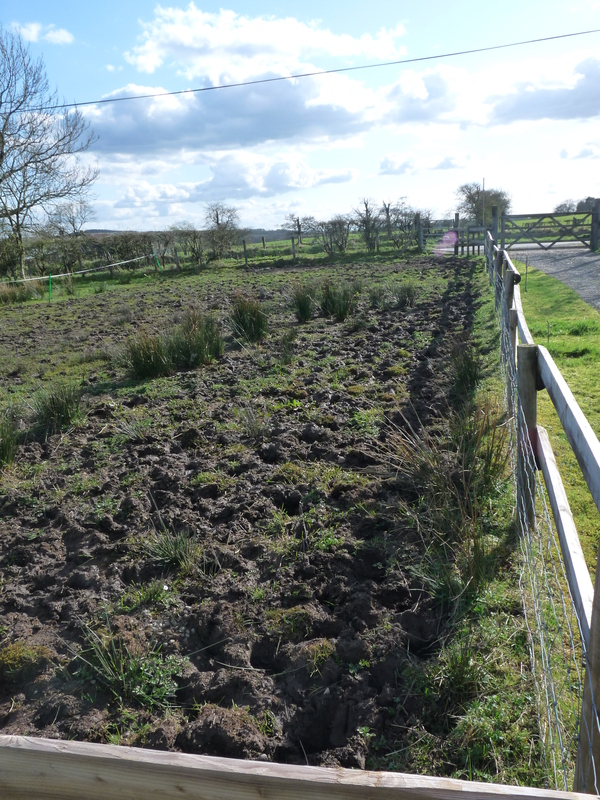 We carried out no ground preparation before planting, and mulching seems to have had no discernible effect. End of the first growing season, October 2013. The willow grew by around half its height again during its first season, and required no maintenance from us, other than protection from the horse. We have now (January 2014) coppiced almost all this first crop to provide setts for a second round of planting, which will double our stock. These are being planted in horseshoe patterns in our top field to create four, smaller, rounded enclosures, possibly for sheltered grazing by a small flock of something, as yet undecided. Solar(! )-powered electric tape fencing is being used to keep the horse from trampling them. 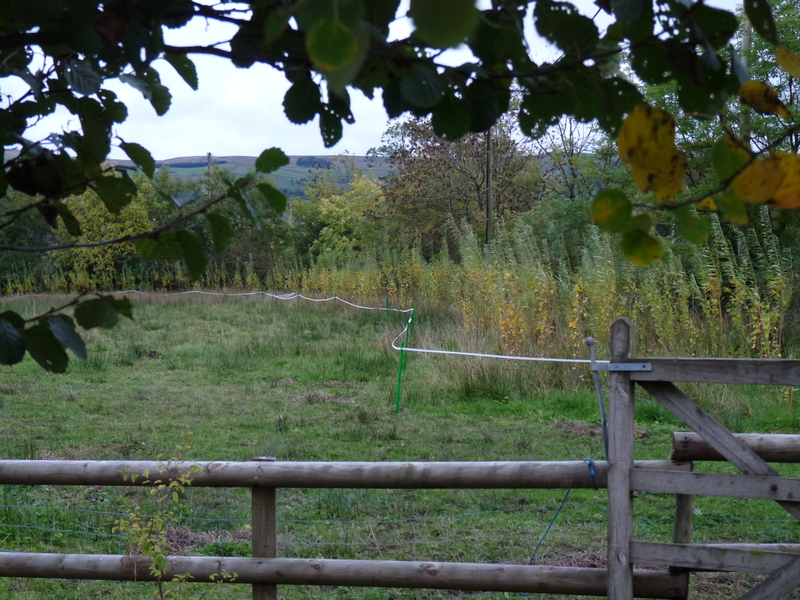 The coppiced willows and poplars will now be left for up to three-four years before being coppiced again, this time to provide the biomass harvest. So willow appears to be a success. 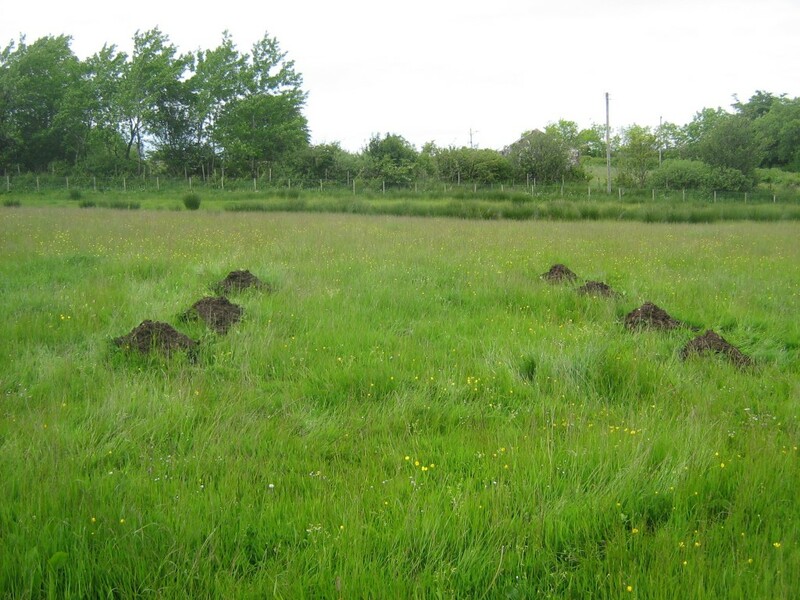 It likes the land, out-competes the rushes on their own territory, improves biodiversity, is very low maintenance, requires no ground or soil-preparation or fertiliser, acts as a carbon sink, is easy to multiply, and will yield a valuable harvest. We’ll have to see how many of this year’s setts take, but we’re hopeful most of them will. Beef or What – Part 1? Without exception, every farm in the Bewcastle and Stapleton parishes raises beef and lamb. This requires the conversion, and the maintenance, of the land to grass. Soft rushes as far as the eye can see! Only a few years ago there was barely a rush to be seen. Our land, typical of that around us, consists of a thin (12-24ins) layer of topsoil over heavy clay, but field drainage was installed across all of it around 15 years ago. Nevertheless, drainage is still a serious issue and the soil becomes waterlogged after a few days of heavy rain – a common occurrence here. Soil conditions then become anaerobic and most life within it struggles to survive. In addition, heavy rainfall and the ensuing saturation means nutrients are continually being leached out of the soil, which then has great difficulty in growing and retaining fertility. In addition, some farmers advocate liming every 5 or 6 years. 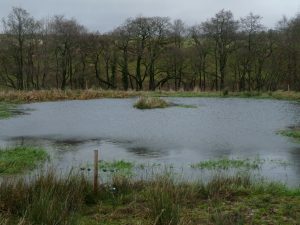 Many also use herbicide to suppress the growth of rushes and docks. 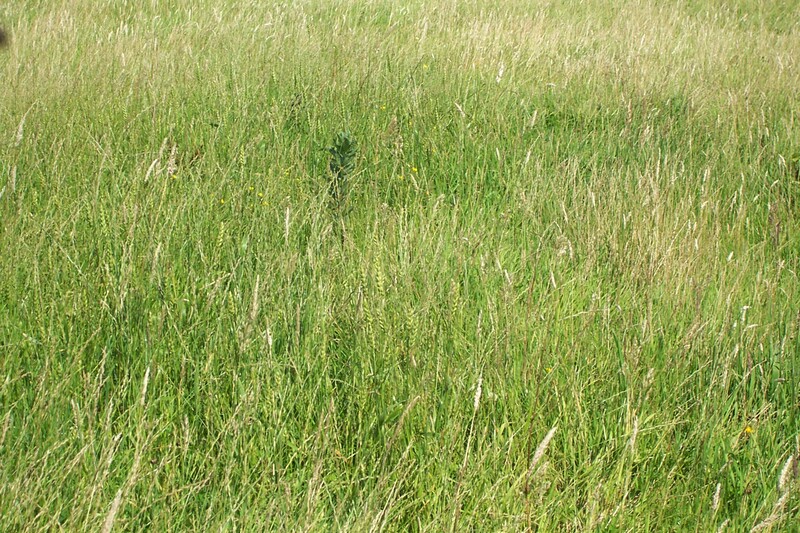 Cutting for silage (or, in good years, like this one, for hay) replaces grazing for meadows. Most of this requires the use of heavy, and very expensive, machinery to be carried out on a large scale (anything over a couple of acres), particularly the drainage, spreading slurry, ‘topping’ rushes, cutting silage and applying fertilisers and herbicides. In other words, farmers are waging a continual battle, spending enormous amounts of energy and money, to subdue the land into a prescribed pattern that is alien to its natural ecology. At Greenholme, we are attempting to minimise our use of imported energy (including fossil fuels) on our small patch of 6 acres. But scything rushes is jolly hard work! It takes around 8-10 man hours to scythe one acre of them, not including gathering up the cuttings. And once cut, they grow back again, faster than grass, unless grazed. Most farmers take pride in their animal husbandry. They are in continual contact with their creatures and it is rare that one of them has an ailment that goes unnoticed. Traditionally, an intimate knowledge of the soil was also an integral part of their ken. However, in a conversation earlier this year, a farmer admitted he knew very little about the soil. He didn’t know its type, pH, nutrient levels, mineral or humus content. Nor was he particularly concerned. The reason? It was now part of the service offered by the fertiliser company. A sales ‘rep’ comes round every year who tests for the pH, levels of nitrogen, phosphorus and potassium (NPK), and then tells them what they need to put onto the land. In fact, he doesn’t even do that – he just orders whatever he deems necessary for them. When asked if the rep didn’t have a vested interested in making money for his company, the issue came down to trust and the long-standing personal relationship between him and the rep. The ‘outsourcing’ of this whole dimension of farming and knowledge is a worrying state of affairs. It means that the care of the soil, those vital few inches of topsoil that sustain life on this planet, is actually now in the hands of the multi-national chemical companies. And who would be willing to knowingly trust the petro-chemical industry with the ‘care of creation’, or even with our lives? For farmers here, the additional problem with raising beef is that cattle cannot stay outside for most of the year. The amount of rainfall we receive means that, once the growing season has slowed down, the cattle have to be moved indoors otherwise they poach the land so badly it will not yield the precious grass next year. This year, despite the very late start to the growing season, the cattle are only now being brought in (end of October). So they have been out for about 5 months. Last year was awful and they were only out for about 4 months. That means they are indoors for 7-8 months, while the land stands empty, and have to be fed from the silage or hay cut during the year. But both cattle and sheep also require feed from concentrates during the long winter months. This, of course, has to be paid for, as well as shipped in from, and grown on land in some other part of the country. So the actual amount of land used by our farmers to grow their produce is significantly larger than the land they actually farm, even though much of their own land stands devoid at least of ‘beasts’ for most of the year. Particularly in the case of beef, the question of whether this is the best, or only use of land in these parts is rarely, if ever, asked. But it is a question that needs answering. Few of our farmers are ‘well-off’, in the sense of having significant expendable income, and most only survive because of the Common Agricultural Policy subsidy – the Single Farm Payment. We don’t need to discuss the gross injustice of this payment system to the wealthy at the moment, but it is the only thing standing between many farming families and starvation. If, and when, this subsidy is withdrawn from hill farms on ‘severely disadvantaged land’, which it all is around Bewcastle, most of the families farming here will have to sell up and move out. Of course, if the price of land was to remain as high as it is this would be a very attractive option for those who own their farms. For tenant farmers it would be a disaster. But if the CAP subsidy was removed and raising beef and cattle alone could not provide a living, what would then happen to land prices? So what are the possible alternatives? June and July were sweltering! Unfortunately we weren’t recording weather data until the second half of July, but we are now an official Met Office weather observation station. We have been up and running for a couple of months and most teething problems have been sorted. Originally we approached the Met Office to see if either they had any old equipment they could give or sell us, or they were interested in having an observation station here. As it turned out, there was a gap in their network – just here in Bewcastle! That meant they would provide and maintain all the equipment if we would commit to undertaking daily readings – which is precisely what we wanted. Tony Eastham, Regional Network Manager for the Met Office, installed the site once he had selected the exact location and we had erected the fencing. We selected the climate variables we wanted to record, with one of the main criteria being simplicity – we wanted no electronic gadgets. The only thing you can know for sure about anything electronic or electrical is that it WILL break – one day. We wanted equipment that will keep going and going, through all weathers and in all conditions, for tens and tens of years. We also wanted to record soil temperatures for growing purposes. The installed Met Office station. Visible are the Stevenson Screen, the raingauge, and the sunshine recorder. Also the top of the 100cm soil thermometer cap is just the other side of the fence. The view is towards East (the Orient). So all our equipment is ‘low tech’, but precision. Mainly thermometers – we have 8 of them: one ‘dry bulb’ (air temperature), ‘wet bulb’ (measures humidity when compared with dry bulb), maximum and minimum reset every morning, grass minimum, and soil at 10cm, 30cm, and 100cm. Inside the Stevenson Screen: dry bulb (left), wet bulb (right), maximum (horizontal upper) and minimum (horizontal lower) thermometers. Grass minimum can be seen on the grass in the background, just above and to the right of the raingauge. We also record rainfall (24 hr), barometric pressure (both weekly charts and precise instantaneous), and have privately installed four tensiometers, recording soil moisture tension (the suction that plant roots have to exert in order to extract capillary water from the soil) at 20cm, 40cm, 60cm and 100cm. These latter are not reported to the Met Office but are for our own records. In addition, at the time of the observation (9am GMT), we record visibility, wind speed and direction, ground state, snow depth (if any), and current (or recently ceased) weather. However, the pièce de résistance is the sunshine recorder. Ours is the only one north of Morcambe Bay (in England). In this extraordinary instrument, the solar system can be seen at work. 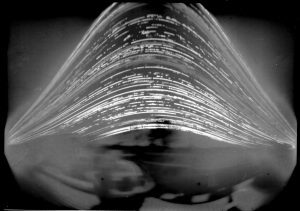 Sunshine Recorder with an inverted image of Greenholme. 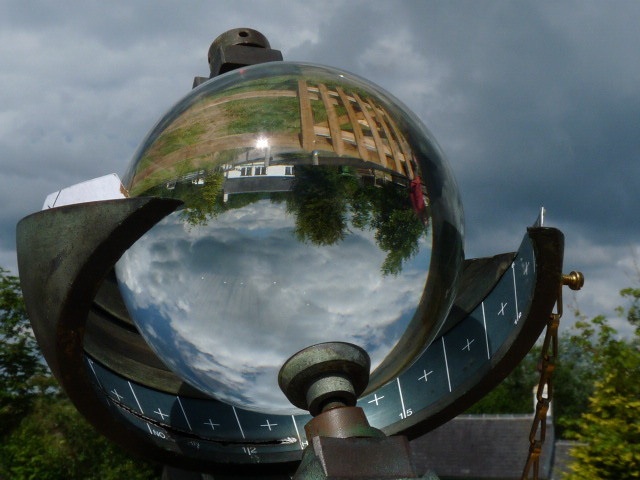 It operates in much the same way as a sundial, except that, instead of casting a shadow, the sun’s rays are concentrated through the glass globe and brought to a focal point on the frame behind. The frame is fitted with a strip of paper marked with the hours of the day, and, as the earth rotates on its axis, the focussed beam from the sun burns a trace in the paper. We change the strip each day and measure the total length of time the sun has been strong enough to cause a burn on the paper. In clear skies it burns completely through and we are left with almost two separate pieces! You can observe the burn trace on the above picture, and see it was taken was just before 2pm (1pm GMT, where the burn has currently reached; the ’12’ of midday is visible on the paper). The instrument required careful setting up, as it has to be aligned perfectly with polar south in order to burn an even trace throughout the day. Tony Eastham of the Met Office setting up the sunshine recorder. It is fascinating to observe the progress of the earth’s tilt away from the sun, which at the moment, is observable as a millimetre shift upwards in the trace each day (when we have sun!). Our observations are uploaded daily (usually) onto the Met Office’s Weather Observations Website (WOW). You can view graphs and data there for the last month at any time.